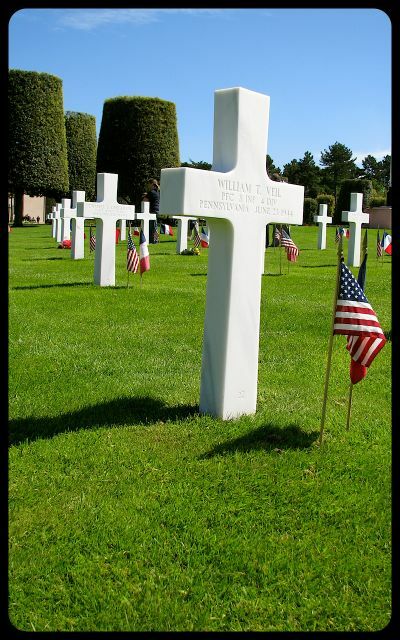 It was a fitting day to pay our respects at the American Military Cemetery in Normandy, France. 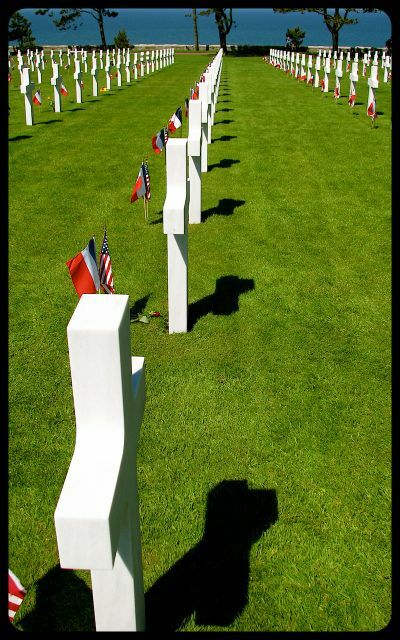 Red, white and blue American and French flags adorned every snow white marker in the cemetery. Clouds made scarce appearances in the sky. Mother Nature had rolled out her best weather. It was Memorial Day 2010. As we walked through the countless rows of headstones, I overheard a young girl, who was dressed in baby pink, asking her mother questions. Her mother had obviously tried to explain to her daughter that this was a place where men were buried. Still, the concept must have been abstract to the little one, who was squirming on the ground, peering at marker after marker. We did not linger to hear what the mother said to her child, but the moment was striking. We could only imagine what other difficult questions the child posed to her family about this place where the souls of so many men slept. How do you begin to explain this chapter of history to a child? 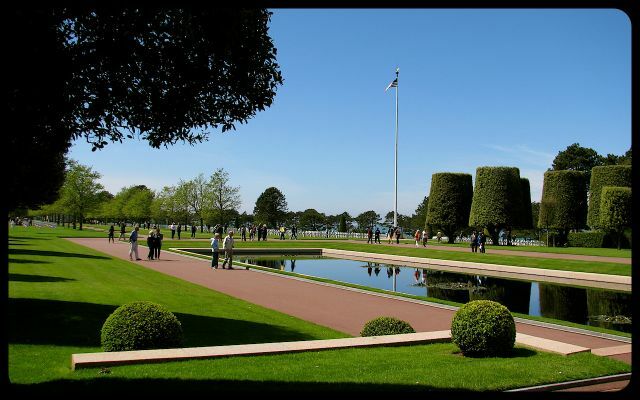 We divided our time between the memorial structures and the emerald green lawn where 9,387 individuals are buried. 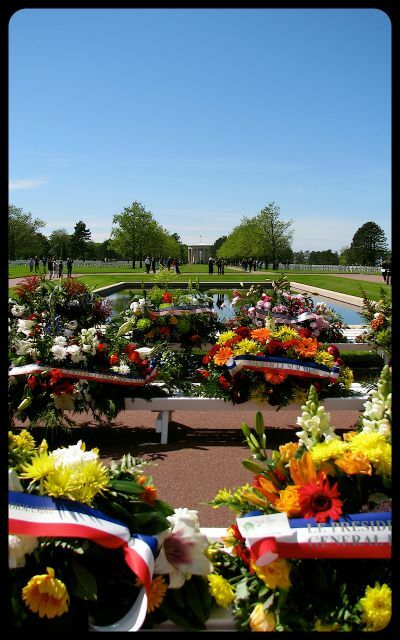 Flowers had been placed by American and French visitors. 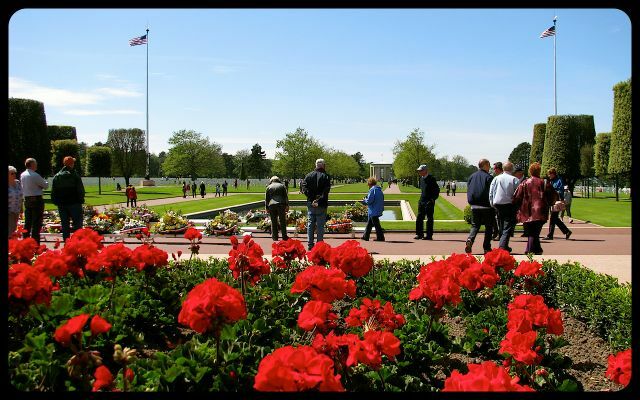 There were bright red geraniums, wilting roses, poppies, and wreaths with messages. 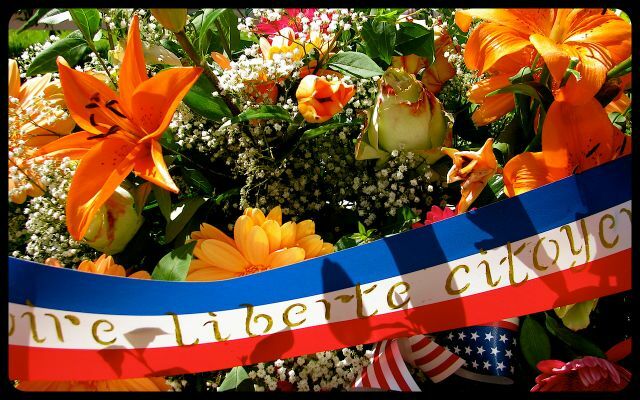 Some flowers had been delivered by French schoolchildren. Others had been placed by community organizations. 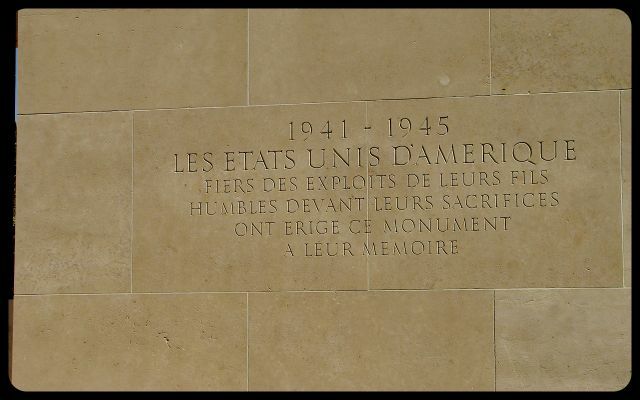 1941-1945: Les Etats-Unis d’Amérique, fiers des exploits de leurs fils, humblés devant leurs sacrifices, ont erigé ce monument, à leur mémoire. 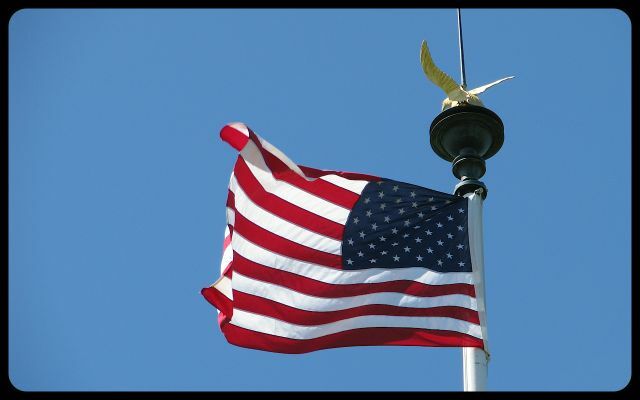 1941-1945: In proud remembrance of the achievements of her sons and in humble tribute to their sacrifice this memorial has been erected by the United States of America. 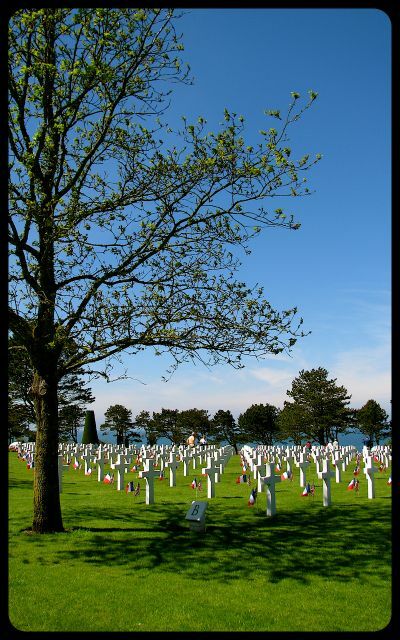 As we walked away from the cemetery, the beaches of Normandy fell into the background. Then we paused, took a deep breath, and remembered. 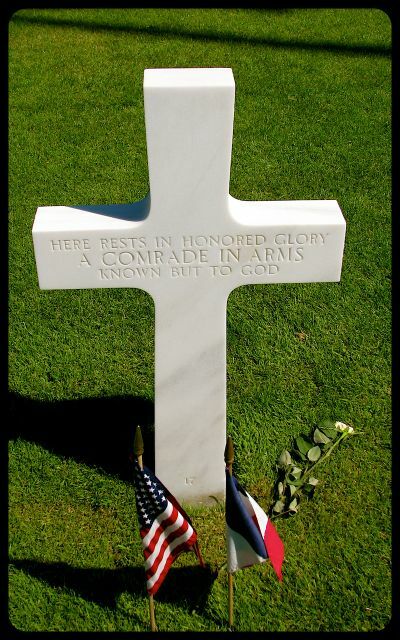 A fitting tribute for Memorial Day. How touching, Virginia! Not only that they tend to the grave so lovingly, but also that a beautiful friendship has been born out of a tragic event. I hope that someday you will be able to meet this kind family! 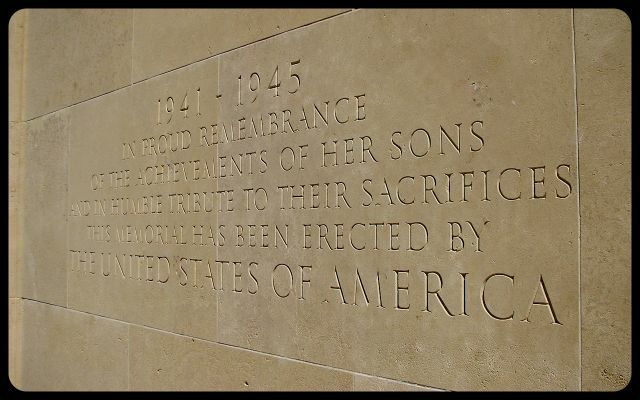 My husband and I visited the Mardasson Memorial in Bastogne, Belgium last spring. It was erected by the Belgian population to show their gratitude. Living in Europe, there’s always so much history in one’s backyard! 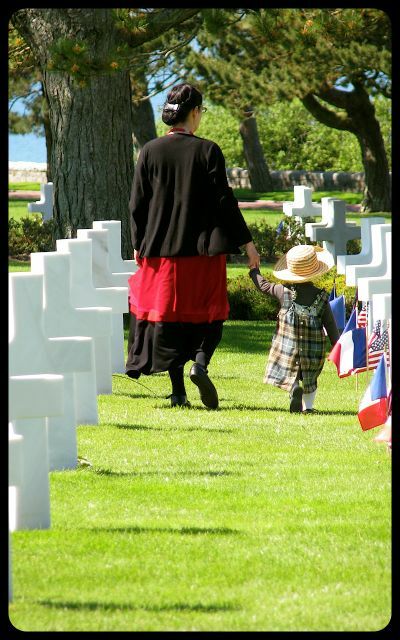 Poignant pictures…least we forget.. They did not die in vain. I’m glad the photos spoke to you, Carole. We also went to the cemetery to remember fallen Canadian soldiers in Normandy. We were there at sunset, with very different lighting. It was equally-touching. Hope you’re enjoying your newfound freedom, now that your studies have wrapped up for the summer! Thank you for dropping by. Your wonderful posting brought back many memories of that trip. It’s nice to commemorate in a true spirit of the day. Victor, thank you. Here’s hoping you’re having a splendid long weekend! 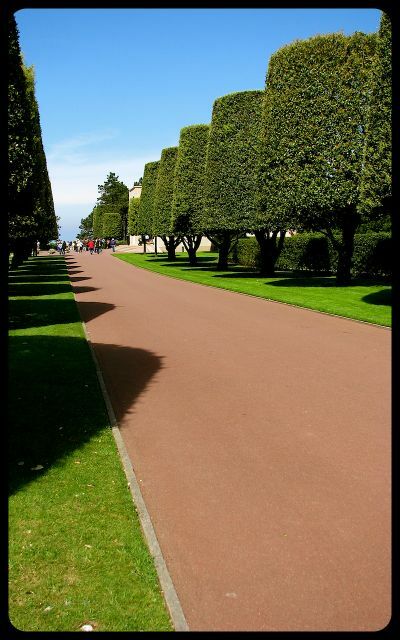 I see some lovely composition here Tricia! Wonderful series! A great compliment – thank you, Sonali! This is a beautifully put together post. Super images, as always, and it is very well-written. This line is a good example: “this place where the souls of so many men slept”. You put it very simply and without overstatement, which makes it all the more poignant. Well done. 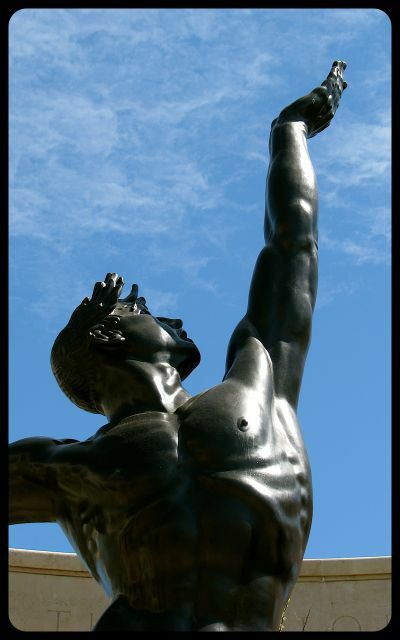 Rachael, I’m pleased that you found the post to be effective in conveying the power of the memorial. We didn’t make it to the British cemetery or beaches (only the American and Canadian) but I am sure they are just as moving as the ones we saw. Great post, thanks again Tricia. Sadly, there are numerous ones like that throughout the cemetery. 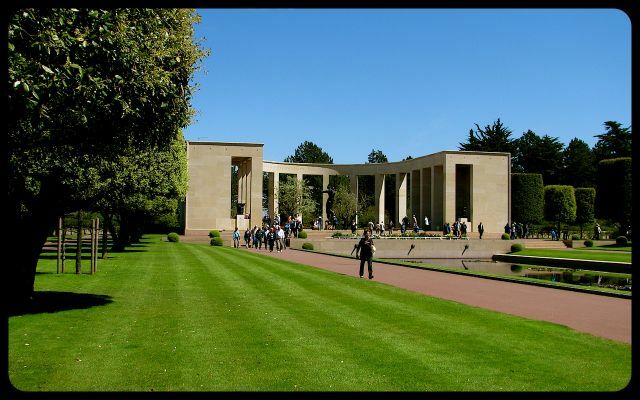 We spent our Memorial Day last month at the Henri-Chapelle American cemetery in southeast Belgium. 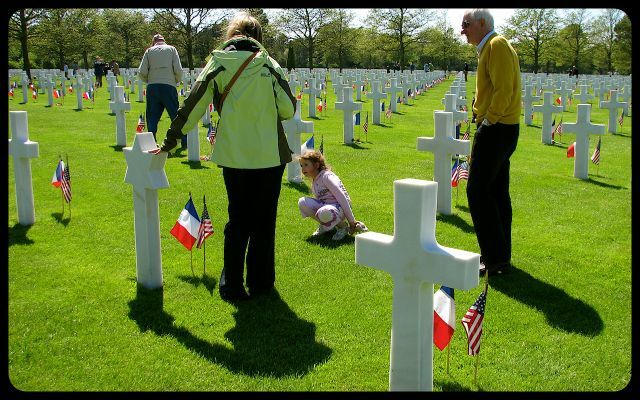 It was a touching ceremony, much like the one you witnessed in Normandy. Many Belgians wearing star-spangled ties, scarves and dresses came to say thank-you to the American military who were killed on Belgian soil during World War II. Thank you for sharing your experience; it indeed sounds as though it was a moving one. 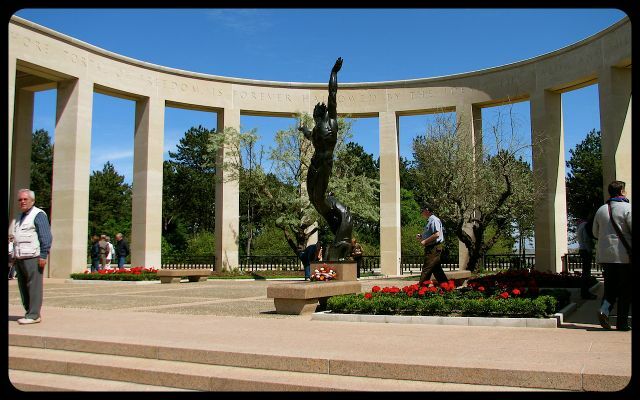 Did you also visit the Mardasson Memorial in Bastogne? 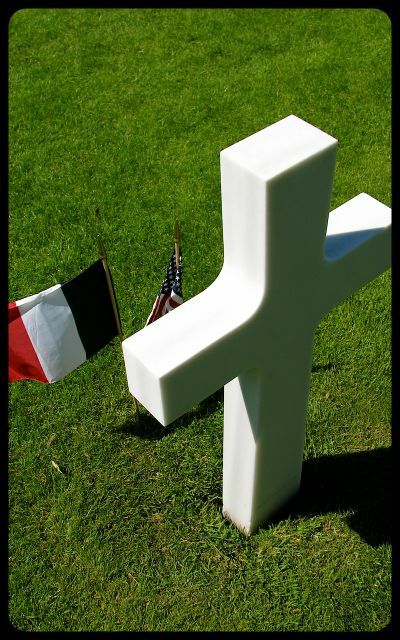 While in Belgium last spring, we went there; it was quite touching to see this monument made by the Belgian people. 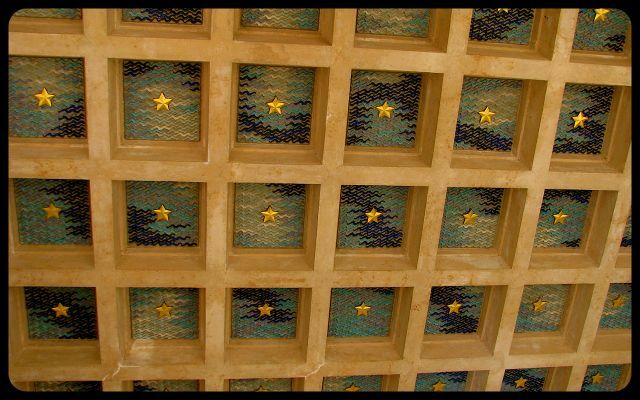 Hopefully soon, I’ll be sharing a post about our visit to the American Cemetery in Manila a few months ago. My grandfather fought in the Pacific during WWII, and it special to visit there. 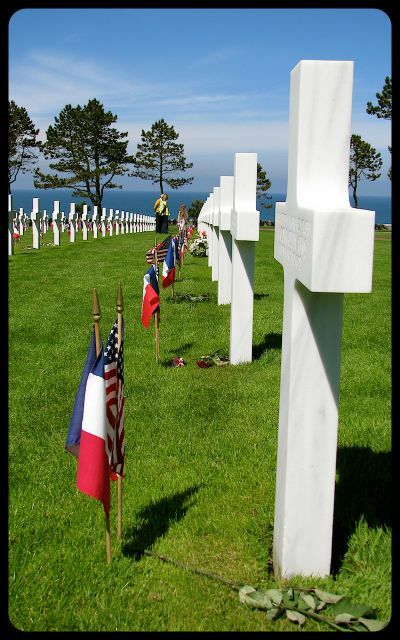 I visited Normandy when I was at school with a few veterans who had been part of the D-Day landings. Very eye-opening and humbling. I’d love to go back as an adult and experience it with a bit more understanding. I love your photos too! Hi there, Got The Postcard :) Thanks for dropping by. Being able to talk with the veterans certainly makes the experience even more powerful. Were you there on the anniversary? It’s hard to believe that next year is the 70th anniversary of the landings. Fantastic photos Tricia! 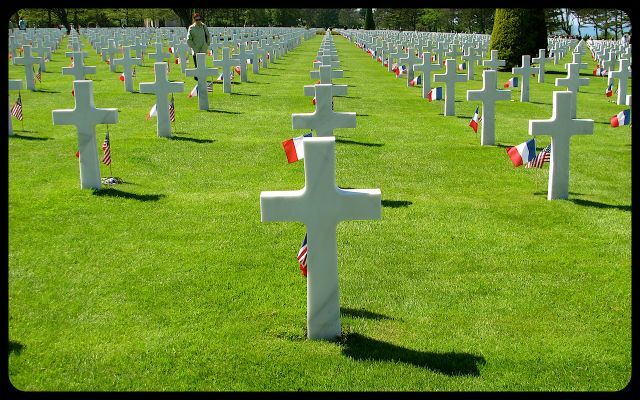 I recently visited the American Cemetary over Easter weekend and I was thinking about that this weekend, wondering what it must be like to visit on Memorial Day. Thank you for sharing this! Hi Mandy, lovely of you to drop by, and thank you for your compliment about the images. 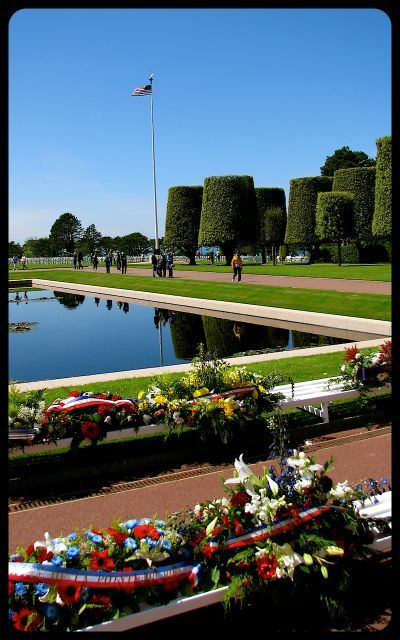 I’ve visited Normandy on Memorial Day and during D-Day commemorations, and both visits were incredibly moving. Last June we were there for the 69th anniversary of the D-Day landings, and it was special getting a chance to speak with some of the veterans, many of whom are now in their nineties. It’s hard to believe that this year will mark the 70th anniversary. 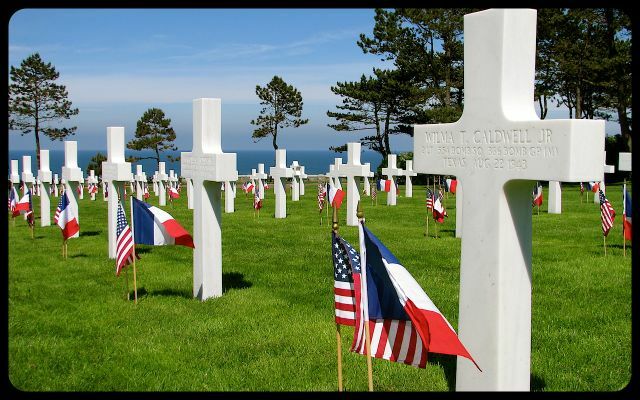 Strangely enough, there were mixed emotions during the D-Day week: somber ceremonies to remember, yet we also saw young & older re-enactors in 1940s garb, read about 1940s dances, and even saw people land-sailing on one of the beaches. 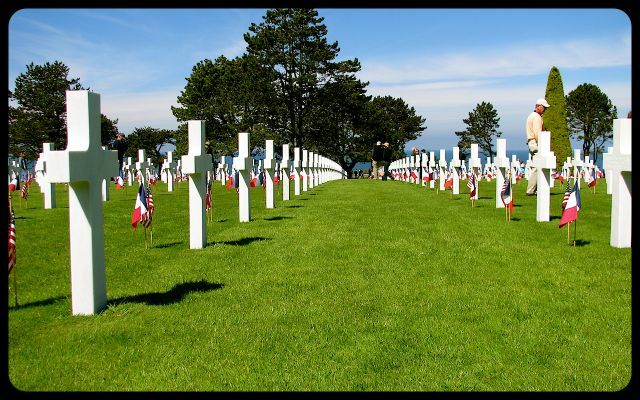 How long were you in Normandy this past spring? 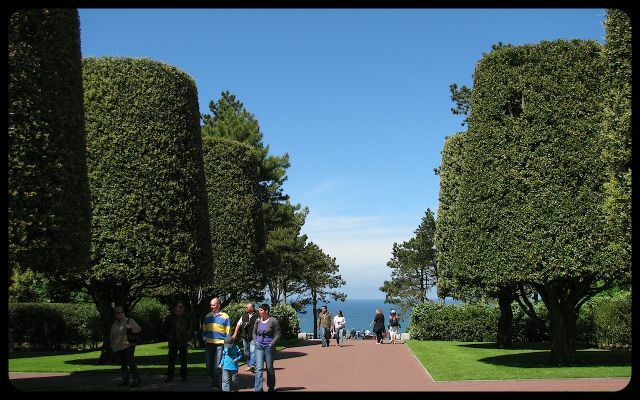 We were just there over Easter weekend and it was only my second visit to France. I enjoyed it so much that I booked to take my mum to Paris in September. Although born in Alexandria, Egypt, my mum lived in Paris until she was 9 and hasn’t been back since! Mandy, sounds like you and your mom have a fascinating background! Has she been back to Egypt? No, never but as far as I know she isn’t as keen to go back there as she is to France. I never thought of asking!